50 year ago, founded in July ‘67, Pacha Sitges was born. The first of a group envisaged as more than a simple nightclub, or a room for a party, Ricardo Urgell created it as a meeting place; A place in which to transmit often peculiar visions and facilitate the enjoyment of life. On 1973, during hippy movement, Ricardo opened Pacha Ibiza. A world-class venue, it was from its inauguration one of Ibiza's most respected clubbing institutions. Since then the brand has been constantly developing together with the culture, its fashion and trends, bringing new ideas and improvements with myriad extravagances to the night scene; although always maintaining its singularity -- Pacha’s proudly particular style and spirit. 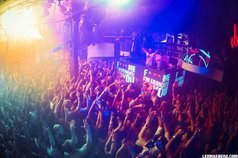 The 3,000-capacity venue features five different rooms interlaced by stairs, doors and secret corridors, a fitting spot to showcase some of the best and boldest parties the island has to offer.